AROOSTOOK COUNTY — High school students in Aroostook County are learning more about career opportunities thanks to a collaboration between the Aroostook Partnership and educators in the region. The Partnership purchased access to the Virtual Job Shadow (VJS) program for every high school in Aroostook County. It is an online career exploration resource that provides all the tools and resources for charting a career path by choice, not chance. End of the year totals show the service was used more than 2,300 hundred times by students and more than 160 by educators. RSU 39 based in Caribou was by far the most frequent user with more than 765 times accessed. SAD 29 and SAD 1 were the next most frequent users. The Partnership picked up the entire tab for the program last year and this year it is a 50/50 split between AP and the districts. In fact, one of AP's newest major investors, Machias Savings, dedicated their $5,000 investment to the VJS purchase as supporting education is one of their top priorities. Dorsey said the online program is comprehensive, students can see videos of different professions, learn about the education and skills needed, job environment, and see the typical salaries as well. VJS is very user friendly and students can access the program from any computer or tablet anytime they wish. Further information is available in high school guidance offices or, if your district is part of Gear Up, from the Gear Up Coordinator. You can also contact Dorsey at rdorsey@aroostookpartnership.org. The Aroostook Partnership is a public-private partnership, representing nearly 100 businesses, Northern Maine Community College, Husson University, University of Maine at Fort Kent, University of Maine at Presque Isle and Northern Maine Development Commission, dedicated to aggressive and effective results-oriented economic development actions that leverage the financial commitments and talents of the private sector in close partnership with the public sector. AROOSTOOK COUNTY — The Aroostook Partnership (AP) and Aroostook County Tourism (ACT) are teaming up to attract more tourists to the region. The Partnership has discussed ‘marketing Aroostook’ on numerous occasions to gain county exposure as well as help grow the tourism segment of our economy. Thus, when the opportunity to increase the number of maps and circulation of the tourism map, AP committed $5,000 toward the publication of the new Aroostook County destination map. The funding will be paired with ACT dollars from the Maine Office of Tourism to make this a more robust overall effort. The map will highlight fun things to see and do in northern Maine. It is being produced by Thalo Blue, LLC., the same firm that recently completed a redesign of the Aroostook County Visitors Guide. Robert Dorsey, President and CEO of Aroostook Partnership, said tourism is a vital component of economic development in the region. “Although not as large as the forest and agriculture economies, tourism is important to Aroostook and with so many spectacular sights and access to the woods and water, The Partnership wants to encourage more folks to visit the region,” he added. Dorsey also mentioned with the establishment of the Katahdin Woods and Waters national monument the opportunity to draw more tourists to Aroostook County is now. Recent research for the Maine Office of Tourism shows that roughly 1.37-million tourists visited Aroostook County in 2016, which is a 9.5% increase from 2015. That translates into an economic impact of $157-million, up 13.1% from 2015. Tourism represents about 2,784 full and part-time jobs in Aroostook County. The destination map is scheduled to be completed in July. For copies or additional information contact Judy Dinsmore at Aroostook County Tourism by phone at 493-5752 or by email at jdinsmore@nmdc.org. AROOSTOOK COUNTY — Small to medium size businesses in Aroostook County looking to grow, diversify or adapt to a changing economic climate now have another resource for help. 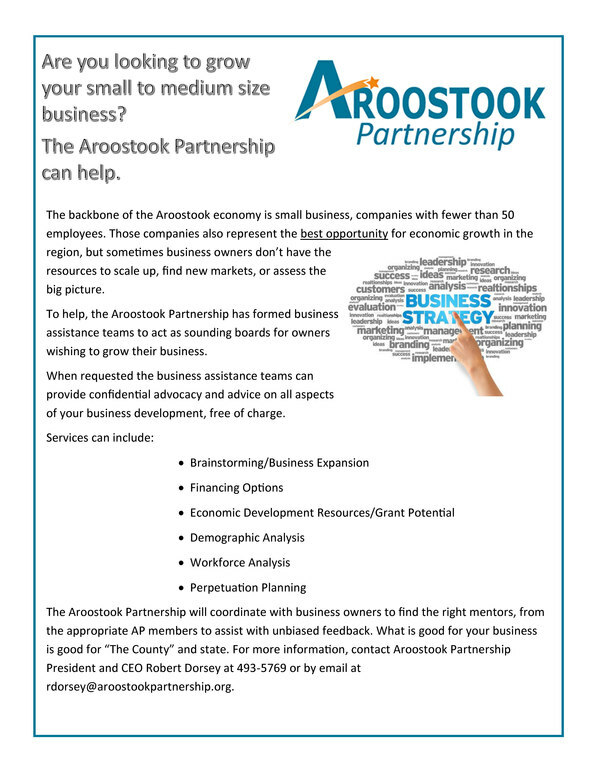 The Aroostook Partnership (AP), a private-public organization, representing more than 100 businesses, the four institutions of higher learning in the region and Northern Maine Development Commission (NMDC), is kicking off a free business assistance program. To help, the Partnership will form business tailored assistance teams to act as advisors or sounding boards for owners desiring help in growing their businesses. Services can include: Brainstorming/Business Expansion, Financing Options, Economic Development Resources/Grant Potential, Demographic and Workforce Analysis and Perpetuation Planning.